21st century alarm clocks need to be smart, voice-enabled, integrate with the Internet of Things, and you only need a swipe to silent them. About two years ago, I started designing maker projects with Arduino Unos, bare-metal ATmega328s, ESP-01 web servers and Raspberry Pis. My background and passion had been in software development and I considered hardware to be almost black magic. But with the great software tools, code examples and support from the open source community I was able to gain a rudimentary knowledge of digital hardware design, and began to build all kinds of fun stuff. Most of my projects have multiple environmental sensors like motion, gas, light, temperature and humidity. I've also learned how to control power to lights and servos. When I first started working with Arduinos and Raspberry Pis, I frequently used bamboo or similar wood kitchen trays and even a real breadboard to mount my projects. The photo below was my first alarm clock which I used every morning for more than a year. Today, I use small antique boxes to showcase my maker projects. 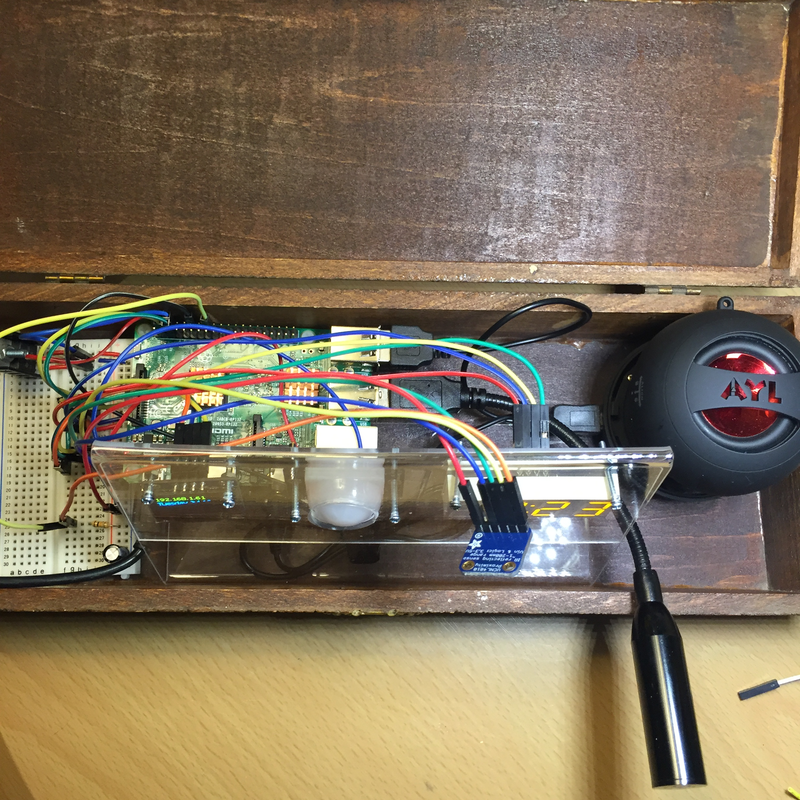 I think there is something cool about finding a new purpose for a 100 year old wooden box when integrating it with a 21st century “Internet of Things” application. Last year I transition exclusively to antique boxes that have an interesting history or character for my maker enclosures. When on vacation, I stop by antique stores looking for boxes that can easily fit a 840 pin plastic breadboard. I get the strangest looks from people working in these stores when I describe their purpose. Once they get the idea, they often become enthusiastic and help me find just the right box for my projects. They know all the nooks and crannies in their store that could be hiding that perfect motion sensor project box made from bamboo imported from post-World War II Japan. That’s how I found the perfect box for my Alexa Voice Alarm Clock in Kalispell Montana. I came across a 1910 Flemish ladies evening glove box. It's in great condition and the box has wonderful patterns burned into surface using a technique called pyrography. I’ve had this box for almost a year waiting for just the right project. And then it hit me, this box was the right size for a Rasperry Pi, a 400 pin breadboard, a few sensors, a small powered speaker and a USB microphone. The project includes two output devices. The seven segment LED display shows time and alarm settings. The OLED display shows the current date, IP address of the PI and status messages. Three sensors provide input. A PIR motion sensor is used to detect occupancy in the room. A VCNL-4010 proximity/ambient light sensor allows the user to stop the alarm process or initiate an Alexa request. The the ambient light sensor controls the light of the displays (next version). If you wave your hand near the VCL-4010 it will stop the alarm. I need to add logic for a snooze function but that will be in the next version. I used MQTT messaging to interface with an Adafruit IO dashboard. It was a great way to control the clock until I add more voice capabilities. It uses Adafruit's MQTT library for communication to the Internet. This is a video of the working version 1.0 alarm clock. The code in this project was from version 1.0. I finished the prototype a couple of weeks ago. I've started working on the next version. The beta uses uses a second Raspberry Pi as a mosquitto MQTT broker. I've modified the code to update the Mosquito broker and then send fewer messages to Adafruit.IO server. I've also started working on an iPhone user interface that communicates with the Mosquitto MQTT broker using the paho library. The prototype iPhone app is very limited today but I plan to make the MQTT broker an option. I'll push everything to a github library as soon as the beta is ready. All of the components fit into the 106 year old antique box. I used an acrylic stand to hold the displays and sensors. # Word derived from the Vishay and Adafruit library. # Setup I2C interface for the device. Simple python class that encapsulates a basic UI for the alarm clock - Day of week, IP address of Pi, etc. # Create image buffer. Make sure to create image with mode '1' for 1-bit color. # Alternatively load a TTF font. Make sure the .ttf font file is in the same directory as this python script! # Clear image buffer by drawing a black filled box. # print "Checking Internet Connection"
print "3 pirWait non block: EMPTY"
print "AVAC HW Main Running"
# Derived from - Example of using the MQTT client class to subscribe to and publish feed values. # Set to your Adafruit IO key & username below. Thanks to Adafruit, Sam Machin, and Many others who contribute Python and Arduino examples.